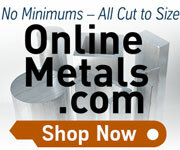 The premier source of tooling, parts, and accessories for bench top machinists. We specialize in parts and accessories for mini lathes, mini mills, and micro mills. Mount, 5C for 3 & 4 Jaw Lathe Chucks, 3"
Mount, 5C for 3-Jaw Lathe Chucks, 4"
Bed Way, HiTorque Mini Lathe 16"
Lathe Mandrel, 1/2" x 5"
Lathe Mandrel, 1/4" x 3-3/4"
Lathe Mandrel, 1/8" x 2-1/2"
Lathe Mandrel, 3/16" x 3"
Lathe Mandrel, 3/8" x 4-1/4"
Lathe Mandrel, 7/16" x 4-1/4"
Backplate Lathe Chuck Adapter, 3" to 3"
Backplate Lathe Chuck Adapter, 5" to 3"
Backplate Lathe Chuck Adapter, 5" to 4"
Backplate Lathe Chuck Adapter, 6" to 4"
Collet, Tormach TTS, R8, 3/4"
Dial Indicator, 1" x 0.0005"
Dial Indicator, 1" x 0.001"
Dial Indicator, 2" x 0.001"
Dial Test Indicator Set, 0.3" x 0.0005"
Dial Test Indicator, 0-4-0 x 0.0001"
Transfer Screw Set, 1/4" - 7/16"
V-Blocks, 1-1/4" x 1-1/4" x 1-5/8"
V-Blocks, 1-5/8" x 1-3/4" x 2-3/4"
Bed Way, SC4 Bench Lathe 16"
Bed Way, SC4 Bench Lathe 20"
Lead Screw Protection Cover, 16"
Lead Screw Protection Cover, 20"
Bed Way, HiTorque Mini Lathe 12"
Rack, Mini Mill Z-Axis, 8.75"
Die Stock, No. 2, 13/16"
Die Stock, No. 3, 1"
Shear and Brake Combination, 8"
Pin Chuck Set, 0 - 3/32"
Pin Vise Set, 0 - 3/16"